Join us this year as we give back to the Naples community by helping sponsor Empty Bowls Naples. This all-volunteer non-profit organization's mission is “to create awareness and raise funds to eliminate hunger in our community ONE BOWL at a time”. 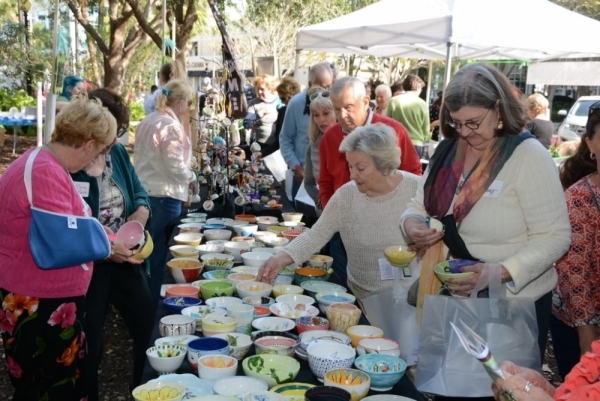 They enlist the creative talents of local potters, artists, educators, students, and volunteers to create handcrafted bowls for their annual event held each year in downtown Naples Cambier Park. Attendees choose a bowl and sample soups from over 50 restaurants and country clubs. Their goal this year is to create 4,500 bowls for their 13th Annual Empty Bowls Naples Inc. event which will be held on January 26, 2019. Volunteers with the IECA will get the chance to decorate and paint ceramic handcrafted bowls provided by the organization which will be donated and used in their annual event to raise money. The net proceeds of this annual event fund the Empty Bowls Naples Inc. Grant Program which distributes funds to mission-related organizations in Collier and Lee counties in southwest Florida. This year they awarded grants totaling $90,000 to five local organizations helping to address the food insecurities in our communities. You don't need to be a professional artist to help! Feel free to view their Facebook page with hundreds of real-life example bowls to help inspire you! There will be a small donation fee to help pay for the cost of the supplies which will be included in the registration process. We suggest you wear comfortable clothing that you don't mind getting dirty and closed-toe shoes. Volunteer-created bowls given out at Empty Bowl's yearly community event.